View from the family room into the future library. 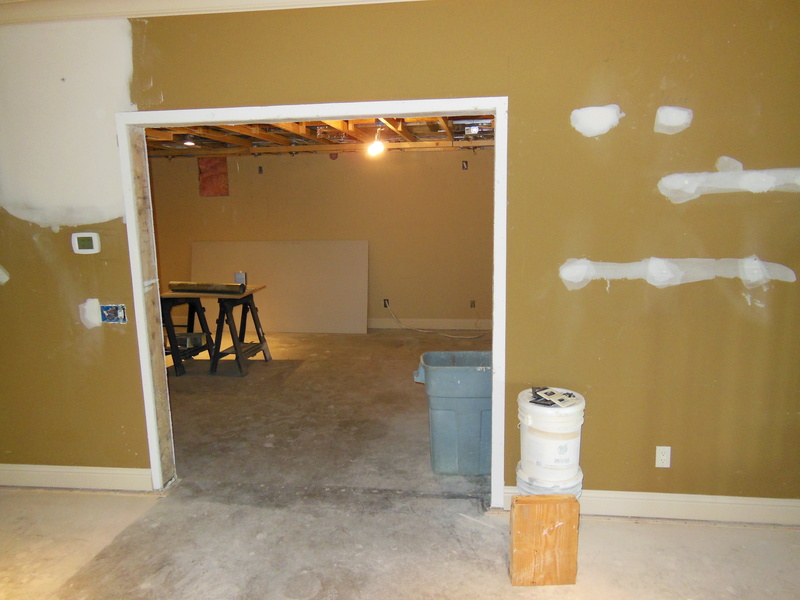 This room was a leftover space between the basement family room and the garage. 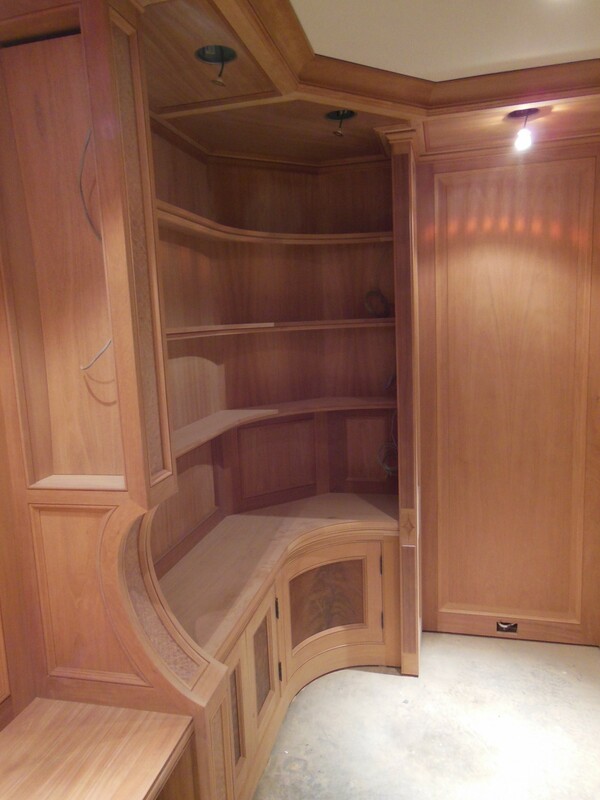 It had been used for general storage but it was a lot of clumsy space that was not being well utilized. 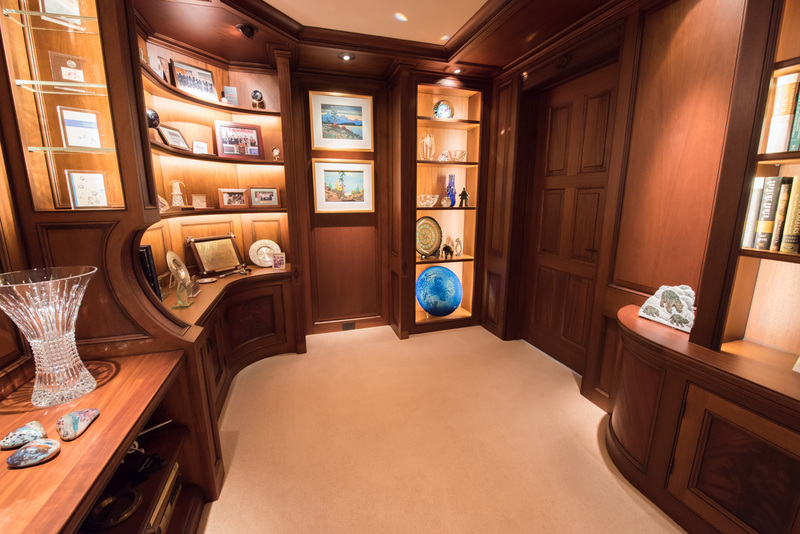 The new owners of the home had just retired from a long and auspicious career and wanted a quiet space removed from the main traffic of the house to enjoy their art and gratefully display memories from their storied lives. They wanted the walls lined with wood display and paneling. 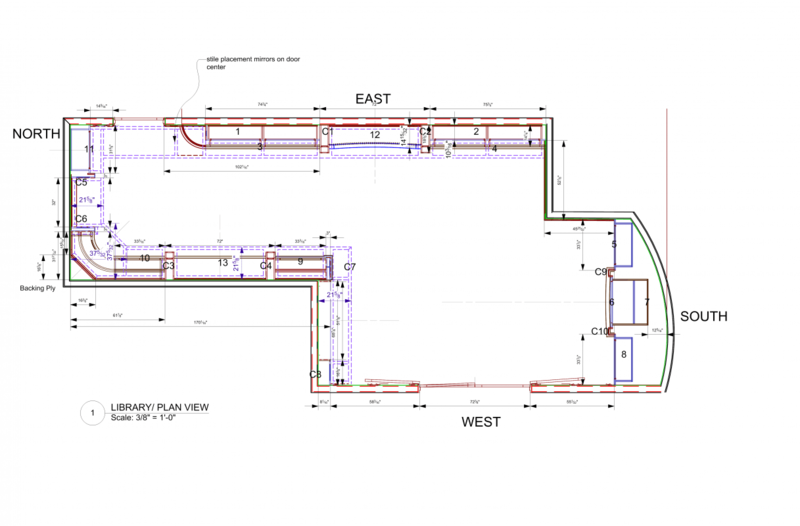 The challenge was to keep the skinny, low ceilinged room from closing in and feeling cramped and claustrophobic while still achieving the customer’s goals. 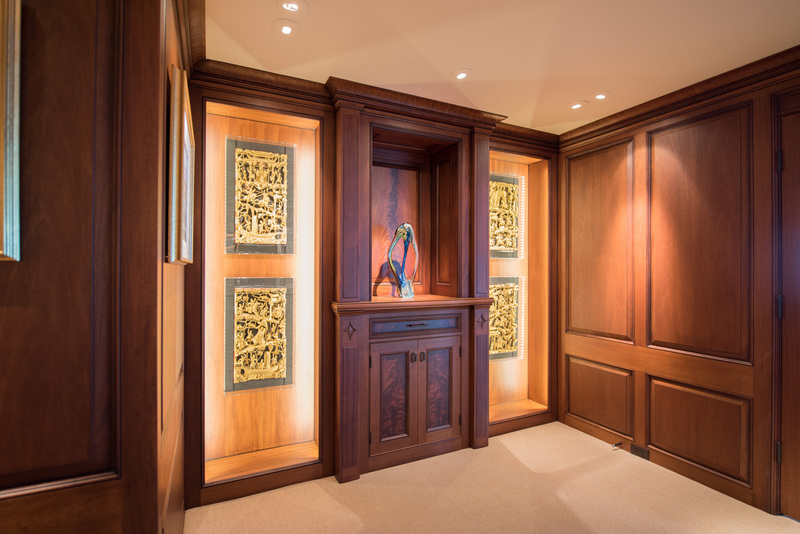 We achieved our goal by creating an illusion that the viewer felt they were in a larger room by making the scale of the cabinetry proportional and substantially smaller than what one would normally expect. They still support the required function but they sit back closer to the walls with the base cabinets much shorter than normal. 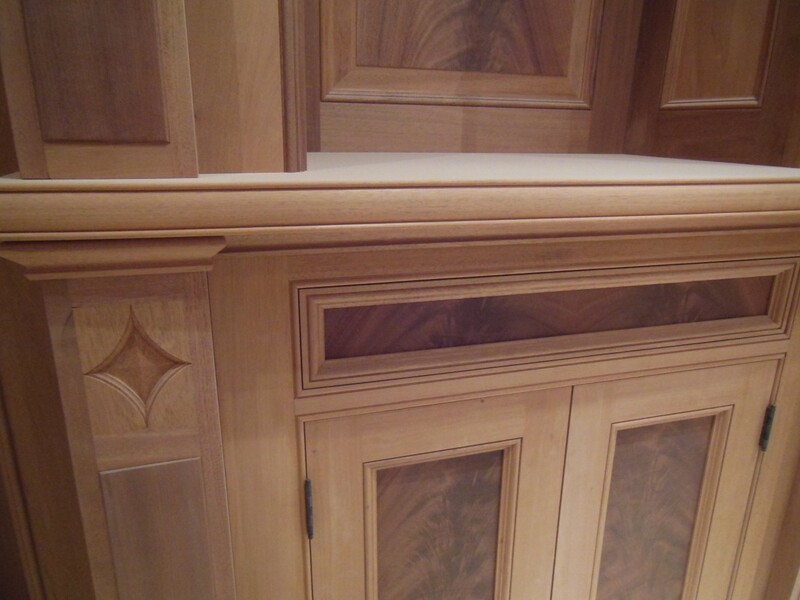 Lighting the interiors of the upper cabinets was also important to allow the viewer to “feel” the space to its extents. 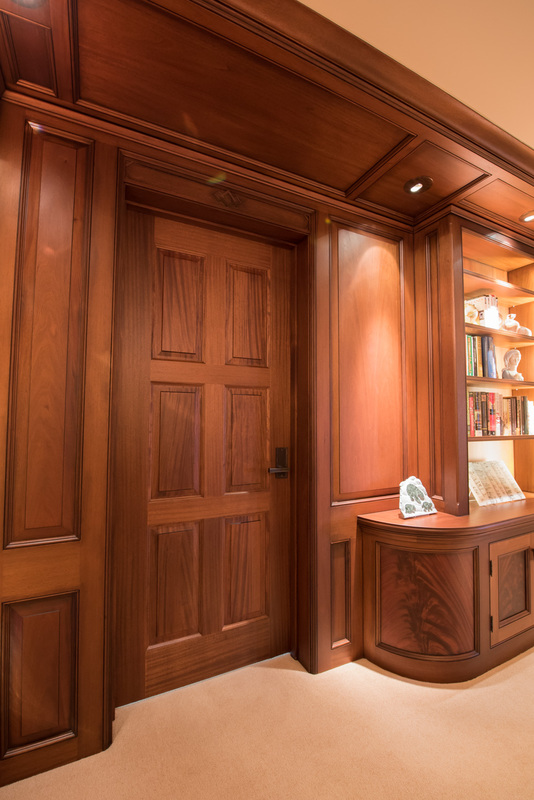 The room is constructed from sustainably harvested Honduras Mahogany with crotch mahogany door panels, redwood burl and sapele accents.The transverse, curved display columns provided four very strong anchor points for the room but, since they were hollow and well lit with glass shelves, they retained a light feeling. 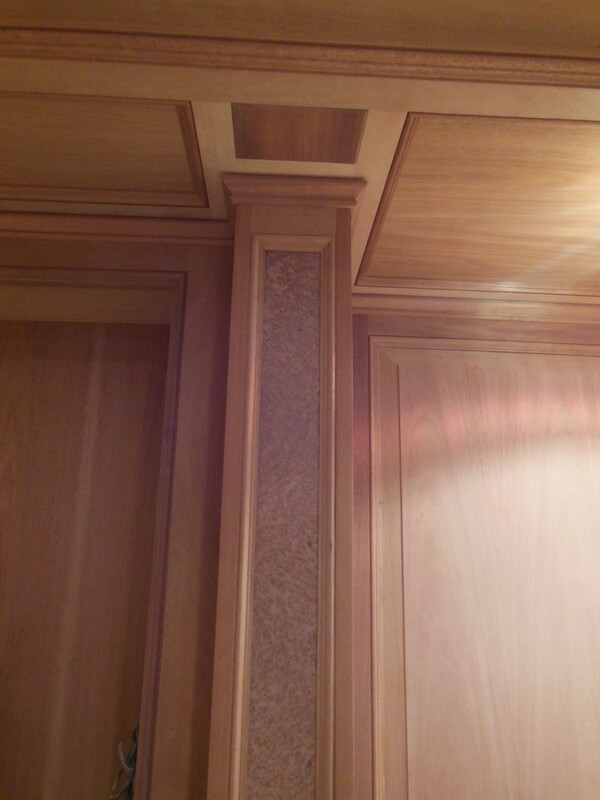 All of the wall paneling in the room is referred to as “fielded” paneling. We wanted the solid feel of a raised panel but a solid panel as wide as would have been required would have failed almost immediately due to seasonal movement. 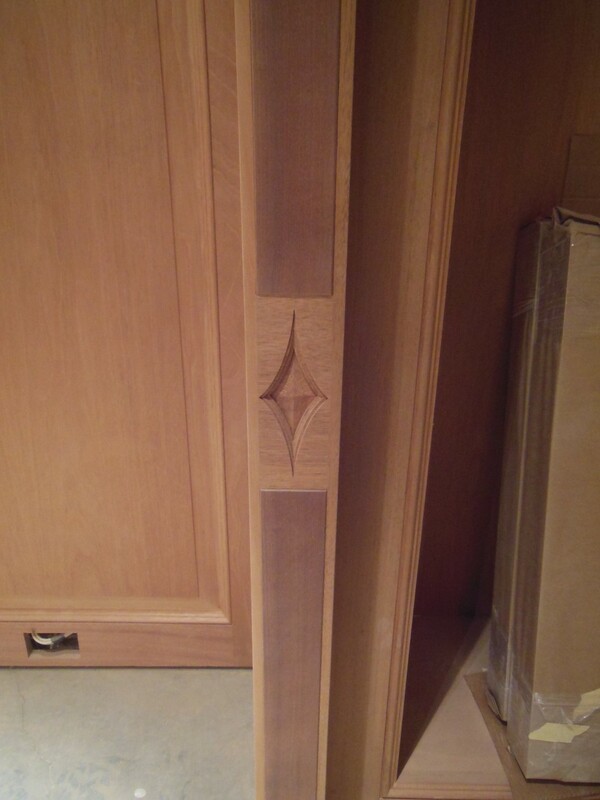 The solution was to miter band a stable mdf center field with mahogany, lay on veneers front and back to make a stable, balanced panel, then machine the perimeter making certain the mitered banding and the exterior machining lined up at the miters. It represents a good deal of effort but creates a solution that will last for generations. We strive hard to imbue our work, your home, with care and even affection. This library was installed by Mt. 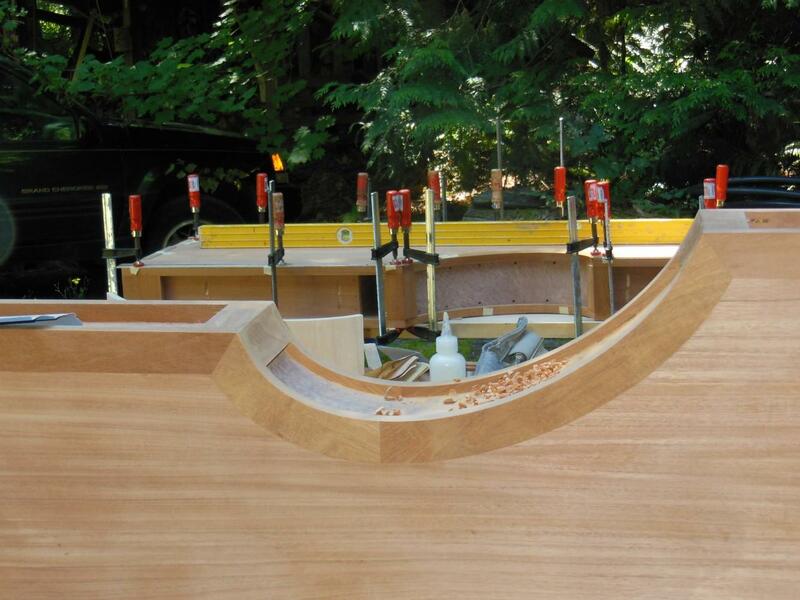 Rainier Woodworking, Jaime Oberg and crew. Their work can’t be surpassed. This is one of two quite wide, column flanked sections in the room the provide a setting for large paintings while creating a sense of space and light as well as a prioritized anchor. 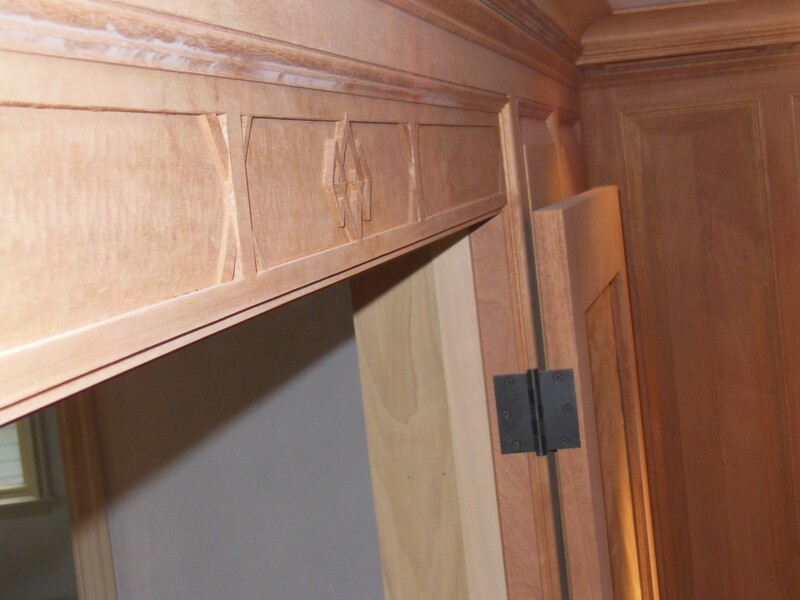 The finish was done by Elliott Paint Co. Inc. 206-241-6267. Such excellent work; we couldn’t be happier. And, they’re a pleasure to work with. 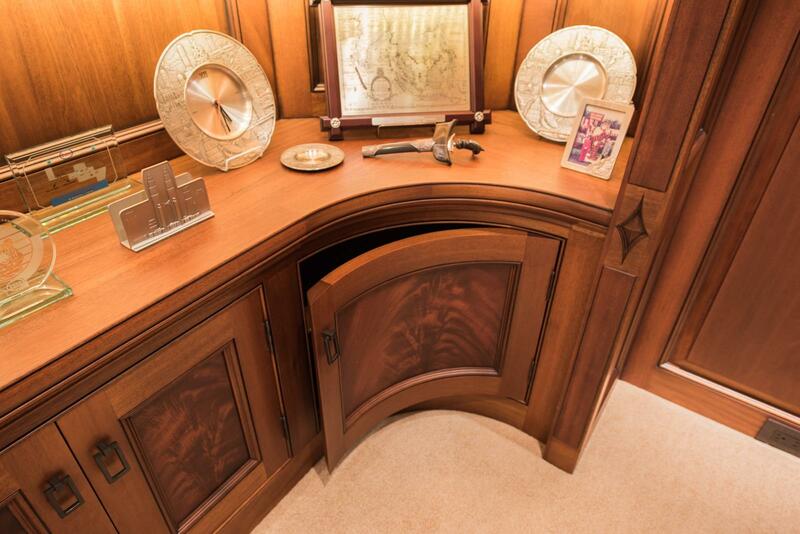 We spent some concerted effort in drawing this curve to be a graceful transition from the base cabinets to the upper display. 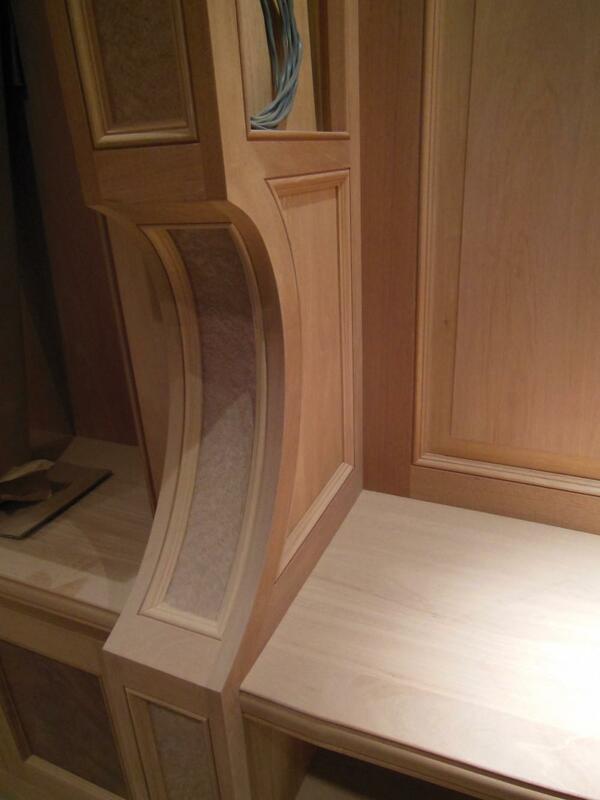 Beginning stages of the curved display columns. 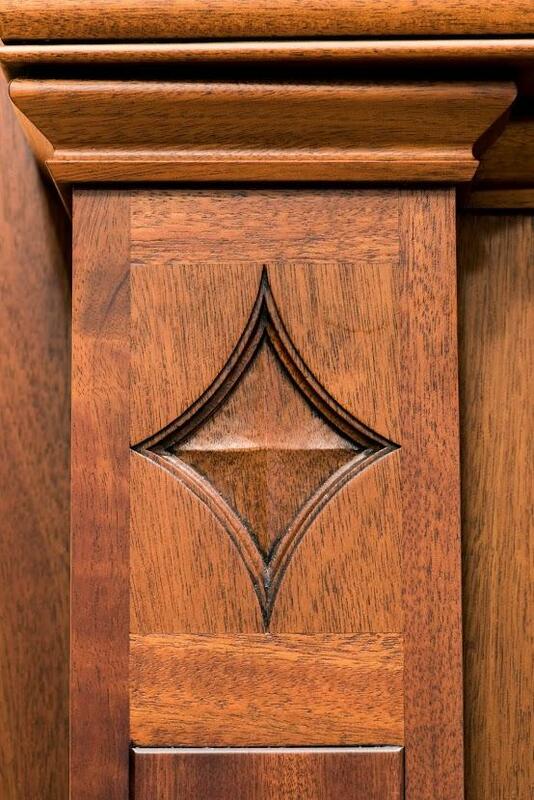 To draw these carved points out to their sharpest extent is a sure sign of a highly skilled and caring human hand. The curved outside corner maintained good clearance in the tight space as well as mirroring the inside curved corner across the room. 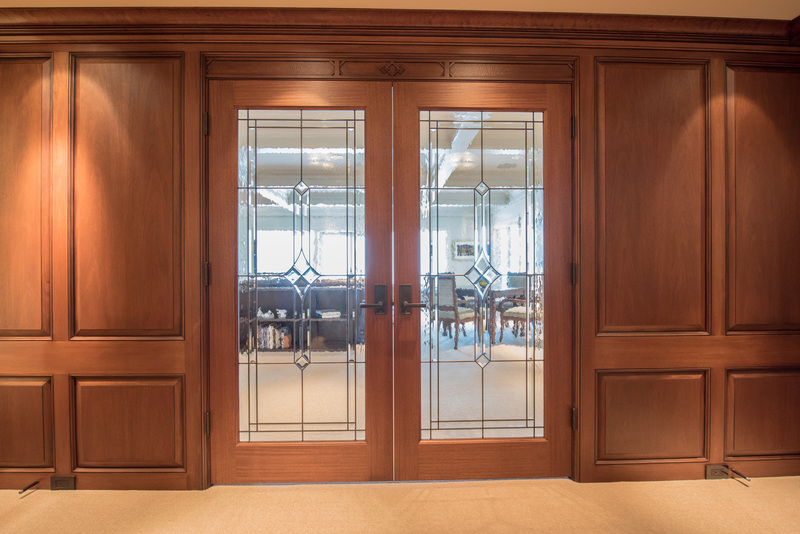 When the doors didn’t line up with the panel it presented a DESIGN OPPORTUNITY. The result was so much better than if everything had lined up. Dont despair when problems arise, the solutions can be beautiful. We make a practice of not boring for adjustable shelving in open display cases..not liking the line of exposed holes. We wait to bore the required holes at a time when the customer has all their “stuff” out and ready to place. 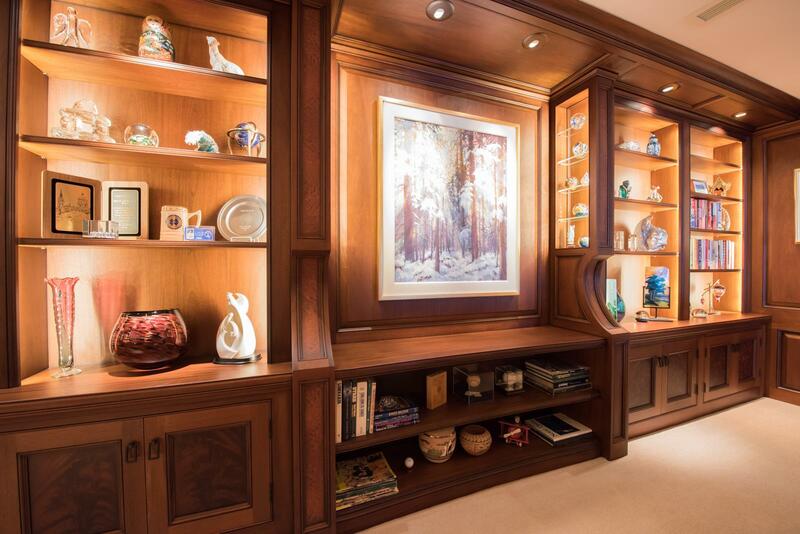 In this case the customer decided to hang their antique Chinese carvings and forgo the shelves altogether. Yay, no holes. Worked out great. Before Elliott Painting did their work. Installed raw wood. The stain and finish are a bit down the road…as is the dusting! 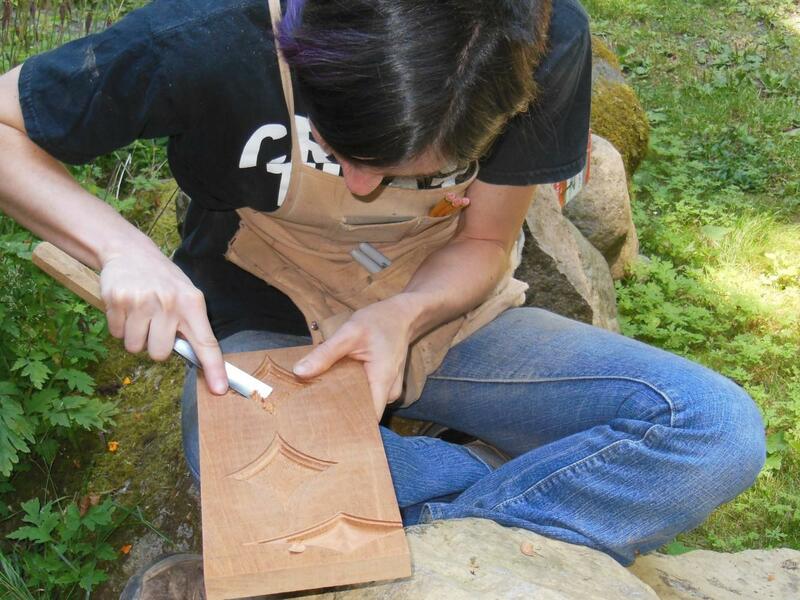 Jessi carves the inset details in the library columns. 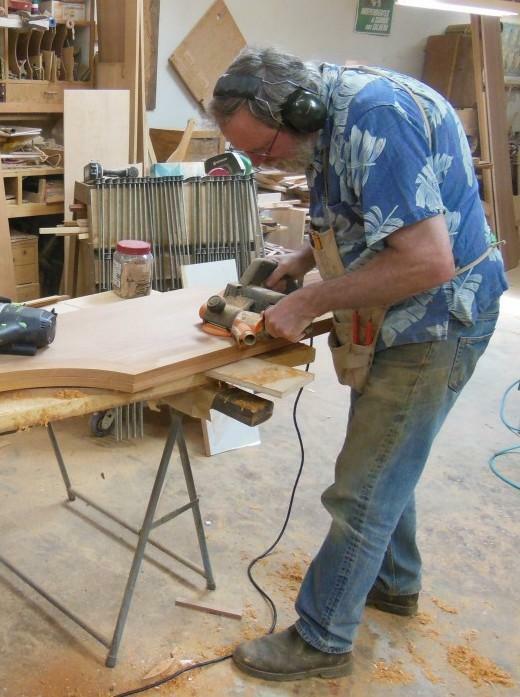 Bringing the corners to a fine, extended point is difficult and exacting work.